Dance Mogul: When did you fall in love with music? Richard Maddock: I’ve always loved music! I started piano lessons when I was three years old and throughout my childhood and adolescence I would play for hours. Dance Mogul: Who were some of your inspirations? Richard Maddock: I loved Elton John’s music, Pink Floyd, Peter Gabriel, Emerson Lake & Palmer, Styx, Supertramp, the Eagles, Queen, David Bowie, The Doobie Brothers, The Beatles and so many more artists, especially from the 60’s & 70’s. I love music that has wonderful melodies, beautiful harmonies and positive, inspirational lyrics. For myself, the lyrics are just as important as the music. I also wrote poetry and composed songs from a very young age. 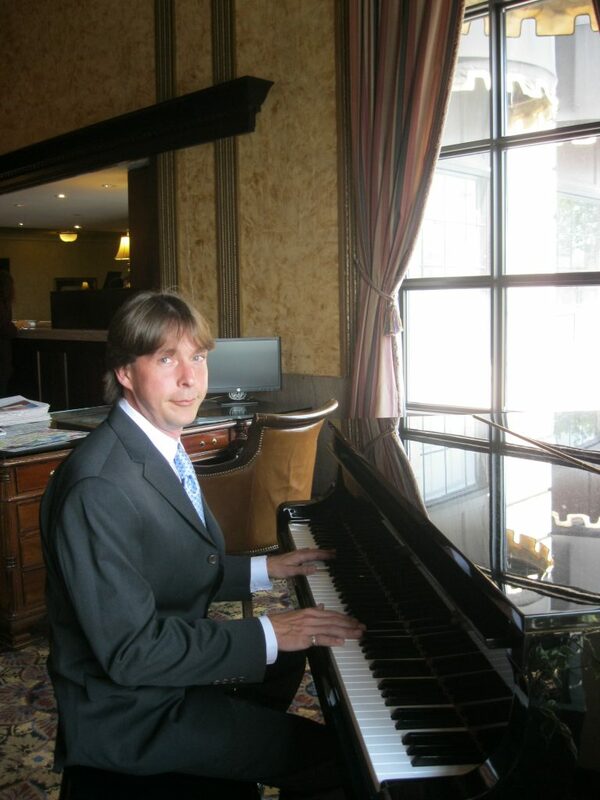 Richard Maddock: I took private piano lessons and played music and sang for hours everyday. At the age of fourteen I stopped taking lessons and began playing at the local dance school in Cambridge, Ontario. I also started to play in rock bands at that age and by the time I was nineteen years old I was making my living as a ballet class pianist. I played and sang in several rock bands until the age of twenty-one, at which point, I moved to Toronto, where I was immediately hired by a dance school and became the school’s head pianist. Playing for dance encouraged me to hone my improvisational skills and to continue to compose and record my own music. I have spent most of my life playing the piano and composing for at least eight hours a day, everyday. So I guess you could say that music has been my passion, my obsession and my escape! For me, to play and to compose music is a deeply spiritual experience and I feel that it is my duty and my life work to honor the gifts that I have been given. Dance Mogul: What inspires you to make ballet music? Richard Maddock: For years ballet teachers told me that there was very few ballet class CDs available for them to use. And ballet examiners from other countries who heard me play for exams also told me that I should compose music for ballet. Playing for so many years as a ballet accompanist — often improvising for four to six hours at a time– and playing for a variety of levels of dance– the inspiration would come from the teacher, the dancers, the energy of the room and of course, from within. To be able to play a small role in helping so many others achieve their dreams, to know that the melodies that are being given to me to share are helping in some way to inspire a dancer, a teacher, or for that matter, anyone who is truly listening — this motivates me to continue to play and to compose. Over the past eight years I have received hundreds of emails from dance teachers from around the world, thanking me for the music I have created for ballet classes. As an artist, there is no greater gift than to know that your work, your art, is being appreciated and that it is being shared with literally hundreds of thousands of dancers of all ages. I feel very blessed to have found a way to be able to express myself through music and to know that my work is being interpreted by so many other artists — artists who are pursuing their dreams, who are honoring their love and their passion for creating art and beauty in the world. This inspires me and I will continue to do all I can to compose music that will (hopefully) continue to inspire dancers and teachers for many years to come. Dance Mogul: What have been some of your best bodies of work that you are most proud of? Richard Maddock: Each of my CDs is representative of my own spiritual journey as an artist and as a composer. I actually find it difficult to say that I am “proud” of my music, as I have always felt and believed that the melodies have been given to me from a higher source. It is something that I feel I will never be able to properly put in to words because when I try to define it much is lost in any definition I try to present. I will say that I am very thankful for the success that my children’s ballet/creative movement class album, “Music for Movement and Imaginations” continues to receive and I am delighted that it is inspiring a new generation of dancers. The album I feel most strongly connected to is “The Garden Within.” For me, it represents a spiritual communion between God and myself. For me, God is Love, and all the melodies that comprise “The Garden Within” album were given to me in the moment of the actual recording. I almost always record with my eyes closed. I become very quiet within and allow whatever is meant to come out to be expressed through my hands on the piano. The most touching reviews I have ever read about any of my albums have been written regarding “The Garden Within,” and they have been written by people from all walks of life and of all ages. Dance Mogul: Are there any other dancers or artists you would like to collaborate with? Richard Maddock: There are numerous artists I would love to collaborate with! This year has been a year of wonderful surprises. Ken Ludden (director of The Margot Fonteyn Academy of Ballet) and I are working on a series of albums for pointe classes to accompany the Academy Method teaching syllabus. Ken contacted me a short time ago and asked if we could collaborate on creating specific music to go along with the exercises that Dame Fonteyn organized into her curriculum. We have already started working on it and will be completing an entire series of albums. For me, this is an incredible honor to be involved in such a monumental project. I asked Ken why he chose me to collaborate on this syllabus and he wrote, “You are the only one I’ve approached about this project because you are the one who has created music for ballet class that is alive and matches the eurhythmic reality of the dance. It is quite exciting, your music, for dancing in class.” To be told this by someone who has worked side by side with one of the greatest ballerinas of our time is incredibly humbling. Dance Mogul: What advice would you have for the next generation of artists? Richard Maddock: Follow your dreams! Honor the gifts you have been given by doing the work everyday. It will be difficult, but you will be rewarded with the profound joy and satisfaction of knowing that you have done all you could to grow as an artist and as a human being. Have faith that the road you are on is the one that you were meant to take. Develop a spiritual practice, whether it be through prayer or meditation and make time for it every day. Read about all different subjects and listen to all kinds of music. And most of all, always remember that the life of an artist is a tremendous blessing and take time at the beginning and end of each day to remind yourself of the blessings in your life. Surround yourself with positive, loving people –- people who inspire you, through their way of being, to grow and to be a better version of yourself. Richard Maddock: Where do I begin? Firstly (and most importantly), I would have to thank my parents for giving me the opportunity to take piano lessons and to thank my grandmother, who gave us her piano. If not for these gifts, I probably would be living a completely different life — one that I simply cannot imagine. Along the way I have been surrounded by so many kind and supportive friends — there are simply too many to mention here! However, I would like to give special thanks to a few: Mande Dagenais; Nichelle Strzepek; Francisco Gella; Karen Malek; Kennetha O’Heany; Pia Bouman; Kelly Jones; Tatiana Tchernova; Margot Rospond; Ken Ludden; Renana Peleg; Diana Nicastro; Rebecca King; Kimberly Glasco; Catherine Tully; Alexandra Cownie; Casey Davenport; Frances McDonald; Chris Dale; Tyler Shaw; Kim Fiocca; Linda Hiller; and all of the incredibly supportive friends I have met on Twitter, Facebook and LinkedIn, as well as the thousands of dance teachers, dancers and studio owners who have purchased either my CDs or who have downloaded my music on iTunes and Amazon. To everyone who has ever shown kindness towards me, I am thankful! Of course, I am also thankful to Anthony Harris for giving me the opportunity to have this interview! The person I would have to thank the most though is my incredibly supportive wife, Penelope Dale. Never in my life could I have ever imagined I would be so blessed to marry such a loving soul who would have so much faith in me. Without her support and belief in me, the truth is that my music would have never existed and any success that I have had is due to her and to the divine intervention that brought us together. I have a partner in life who is also an extremely gifted and talented pianist, incredible singer and an amazing teacher. She is my best friend, my soul mate and my muse and I look forward to making music together for the rest of our lives. Thank you Penny! These albums are available in all iTunes and Amazon Mp3 stores. If you have any questions about my music, or about possible collaborations, feel free to contact me at [email protected] .